We have entered the time of year that I just love. It is warm enough to sleep with the windows open, enabling the sweet scent of the spring wildflowers and earthy mustiness of the woods to permeate my slumber. Even better though, in my opinion, is the cacophony of song that greets you as the dawn breaks. This is commonly called Dawn Chorus. We only hear this abundance in the spring as the birds are frantically trying to find a mate. Every year I track the progress of our migrants by the Dawn Chorus. 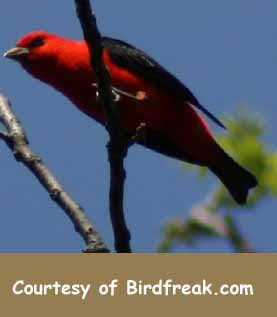 Today the leading songster was a Scarlet Tanager closely followed by the Eastern Bluebird and Wood Thrush. Currently, all the birds are continuing to eat through the rain... guess we will not be having much of a break today. Just as well, in my opinion. It will be a great day to watch our newly arrived Hummingbirds partake of the bounty of wildflowers... and feeders, of course.